My fortieth college reunion is coming up next week. 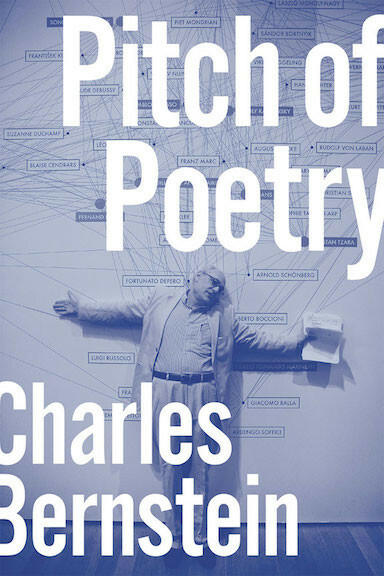 I will be in the Fall Convergence poetics conference in Bothell (near Seattle). Asylum's Press recently published my college senior thesis on Stein and Wittgenstein. 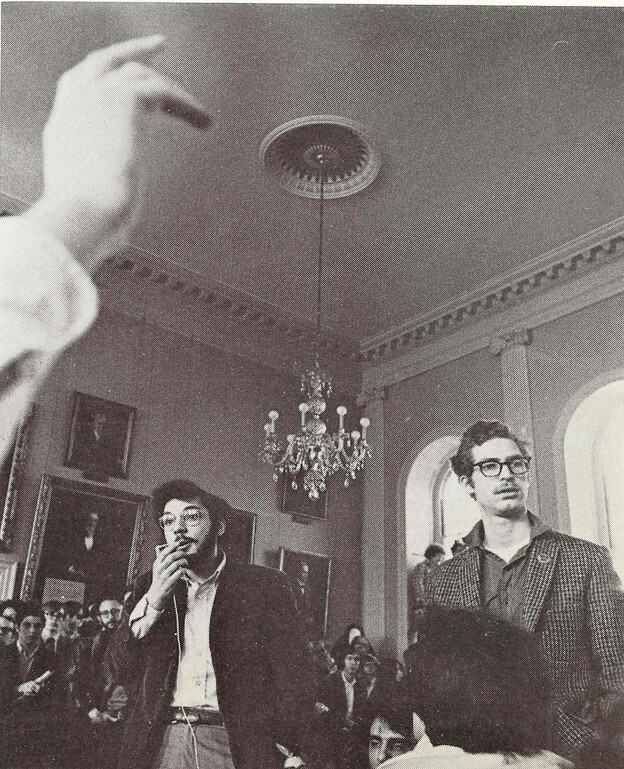 The picture here is from Spring of my freshman year, during the occupation of Harvard's University Hall on April 9, 1969. Next to me is Richard Hyland. A poem I wrote last year called "Strike!," published in the March issue of The Baffler, reflects, in part, on the language of the Harvard strike. 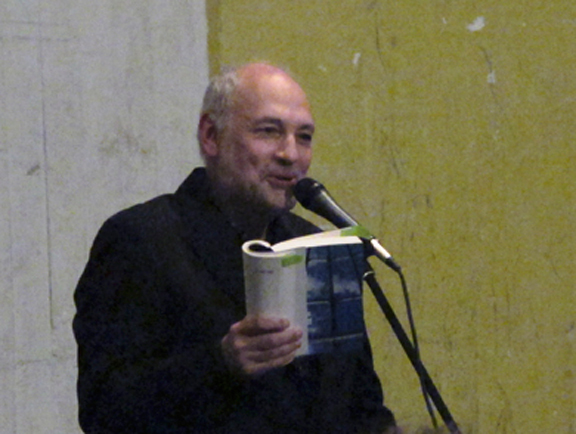 Here's my 1996 account of my college days from My Way: Speeches and Poems, from an interview with Loss Pequeno Glazier. The full interview, with more pictures, is here: Of course, now I've come around to "Rain Drops Keeping Falling on My Head" as a crucial work in the Burt Bacharach and Hal David songbook. For my class's 40th reuntion, I suppose the Boston Pops would do a symphonic version of "Sympathy for the Devil," which is what played in my dorm room those years. LPG:Then you attended Harvard, correct? This must have been quite a change from the cultural and social excitement of Manhattan. Was this a satisfying experience? CB:I found Harvard a rather unpleasant place and was shocked by the snobbism and arrogance. It was unbelievable to me that the “men” at the Freshman Commons would clink their glasses when a woman walked into the hall. If Katie Roiphe and other post-feminists would like to go back to this time, they can have it. This was the last year that you had to wear a tie and jacket to dinner; there were parietals in effect in the still all-male dorms. I found the environment suffocating and depressing. And living in Harvard Yard was like living in a zoo—with all the tourists taking pictures of you and your environs when you poked your head out the door. I have to say, it was an eye-opener to realize how few of my classmates actually cared about the arts, literature, history; though after a while it was possible to find like-minded souls. Still, Harvard students, on the whole, seemed contemptuous of the arts and of learning in a way I never encountered at Bronx Science; I soon came to realize that the enhanced admission for students from elite prep schools pulled down the intellectual, cultural, and moral level of the school, just as it does the country. Talk about affirmative action. In my year only one student from all the public schools of Chicago got into Harvard, while 40 percent of the classes at the elite schools were admitted. I got a real sense of where this was all going when I had a job doing child care at a 25th reunion. At the Boston Pops concert, the middle-aged Harvard grads gave a standing ovation to an orchestral version of “Raindrops Keep Falling on My Head.” I keep that image in mind when I think of our “elite” institutions and what they are doing for our culture. I was not alone in my distress. In my freshman year I became involved in the anti-war movement, even if my somewhat anarchic and pacifist politics did not sit well with some factions of SDS. I was impressed by many of the ideas of the New Left, and especially by the Port Huron statement and the concept of participatory democracy. And I certainly thought something had to be done to stop the war. I was in and out of University Hall during the 1969 occupation, but when the police were called I was in bed, right next door to the occupied building. I quickly slipped into the building and was arrested for trespassing in a case that was ultimately dismissed. Despite the dismissal in a court of law, I was put under indefinite “Warning” by Harvard’s Committee of Rights and Responsibilities (“We’re right, you’re responsible”). I have been amused and appalled to see how in the intervening years some of my classmates who did not take a stand of principle against the war have parlayed their own failure of political judgment into a source of pundit power: I am thinking here of James Fallows and Michael Kinsley. The photo is from The Harvard Crimson: A Year in Pictures, Photo Annual 1968-69, ed. Thomas R. Ittelson and Stephen J. Potter (1969). Photo by Timothy G. Carlson. P. 70.